“Paris-Roubaix is the last test of madness that the sport of cycling puts before its participants. A hardship approaching the threshold of cruelty.” Jacques Goddet, former Race Director. My alarm went off at 4.15am and all the fears from the previous evening came rushing back. It’s not often that you feel scared riding a road bike, but as I pulled on my Team SWR shorts and jersey, I was genuinely nervous. The reason was simple – today I was going to attempt to ride the Paris-Roubaix Challenge, the amateur version of the iconic professional cycling race. First run on Easter Sunday in 1896, Paris-Roubaix has various nicknames, but the two that describe it best are L’Enfer du Nord (Hell of the North) and the Queen of the Classics. So, it has a reputation for being both difficult and brilliant. To a professional cyclist, winning Paris-Roubaix is a career game-changer. Recently, I’d wanted to ask Sir Bradley Wiggins one particular question: would he swap his 2012 Tour de France win for a Paris-Roubaix trophy? I had a funny feeling he might, even though the general public would be incredulous. 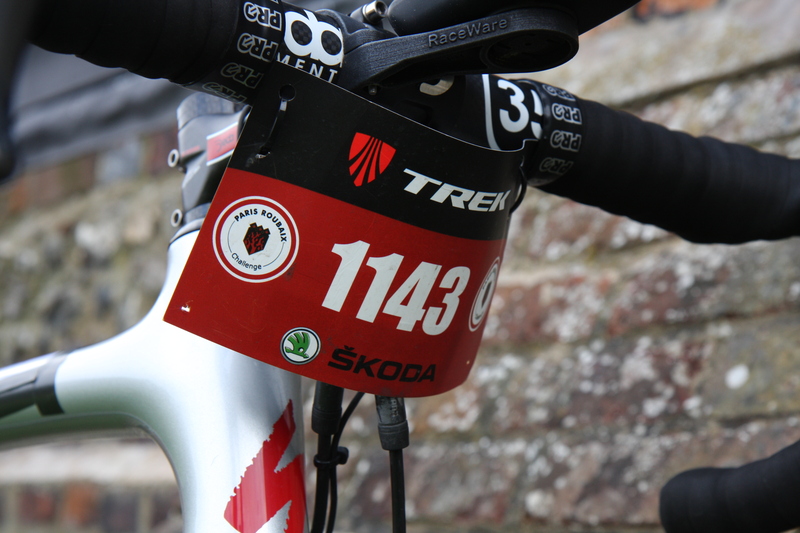 Paris-Roubaix is one of the five annual ‘Monuments’ of one day cycle racing. Incredibly, it doesn’t contain any hills. Instead, it involves 253.5km of racing, initially on roads as it heads north from the town of Compiegne, a non-descript suburb of northern Paris. However, everything changes at 98km, when the race hits the first ‘secteur’ of pavé – ancient cobbled farm roads, laid hundreds of years ago. The secteurs vary in length from a few hundred meters, to almost four kilometers. There are 27 of these gruelling passages in the final 155km, adding up to a total of c.53km and each one acts like a mountain climb, breaking the riders up in a relentless war of attrition, until only the strongest, most skilled and most fortunate head the front of the race. The mythical cobbled sectors of the race are lovingly looked after by Les Amis de Paris-Roubaix, a voluntary group set up in the 1970s to prevent local mayors and farmers paving over them! Each cobbled sector is ranked out of five stars for difficulty, with only Trouée d’Arenberg, Mons-en-Pévèle and Le Carrefour de l’Arbre receiving full marks. To win Paris-Roubaix, it’s said that a professional rider needs incredible endurance, power, razor sharp bike handling skills, perfect equipment and a good degree of luck. I suspected, even as an amateur, I would need a little bit of each of these things, just to reach the famous velodrome in Roubaix, where the race finishes with a lap and a half of the hallowed oval track. “These bloodied and battered warriors struggle through the rain, the cold, the mud, on roads better suited to oxen cart than bicycles. But for the victor there is glory, immortality and a place in history amongst the giants of the road.” John Tesh, broadcaster, describing the race for CBS’s coverage in 1987. I headed downstairs to join 20 or so other riders for a very early breakfast. We were all being looked after by luxury cycling travel company La Fuga and our hosts were already on hand to make sure we had everything we needed. Tom was looking after logistics, John had already coached us the night before on how best to ride the cobbles and Fish, master mechanic, had tended to each of our bikes. I was hoping that I had brought the perfect bike with me – a Specialized S-Works Roubaix, complete with disc brakes: the very same bike that had been ridden to victory in this race in 2008, 2009, 2010 and 2012. I had made three modifications from standard road-riding guise: I’d double wrapped my handlebar tape in the hope of reducing some of the bruising to my hands, I’d added wider, 28mm tyres which offered more air volume, thereby absorbing the bumps better, whilst also allowing me to run lower air pressures (85psi versus my normal 120psi). 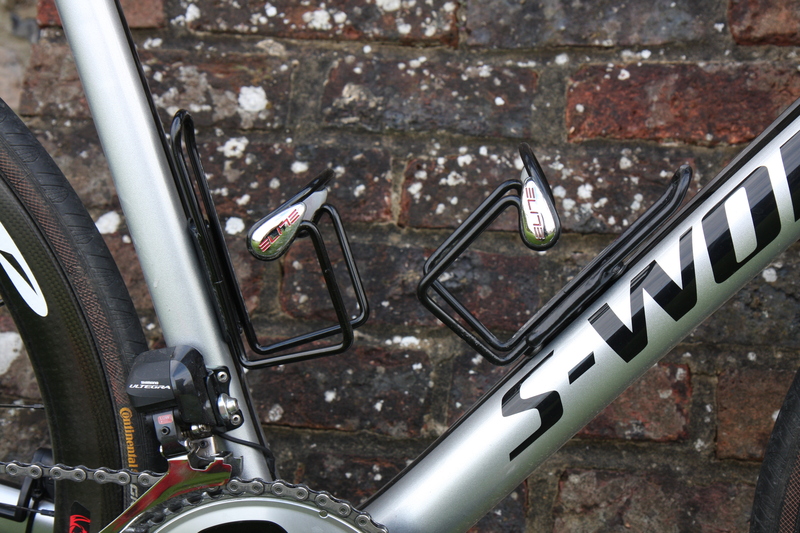 Finally, I’d removed the lightweight carbon fibre bottle cages and replaced them with sturdy aluminium versions which could be crushed down tight onto my water bottles. I was hoping the bike would be strong, compliant and able to survive the impending onslaught. A couple of hours later, I found myself lined up on the start line with hundreds of other cyclists. We had purposefully arrived early and secured ourselves a place in the very first group to cross the start line, the theory being that we wanted the cobbled sections as clear of other riders and vehicles as possible: the more crowded the cobbles got, the more dangerous they would become. The previous day had been beautiful, with dry roads and warm sunshine, but a cold front was now rolling through and the stiff westerly wind had brought rain with it, adding considerably to my sense of foreboding: it’s not often you start a road bike ride with a real fear of injury. The starter’s gun fired and we all rolled away. I’d noted the clothing of various people in my group, but was instantly mixed into a melting pot of Dutch, Spanish, Italian, French and Belgian riders. With wet roads and dirt already flying up off the wheels in front, it instantly felt like I was going to get the complete Paris-Roubaix experience: mud, attrition and suffering. Our amateur route missed out the first 83km of the professional’s route, so at 15km, I took a deep breath, accelerated slightly and flew into the first section of cobbles. This one, secteur 27, was called Troisvilles and had a three star rating. Nothing that anyone had told me before, nor watching the race on TV over the past 30 years, had prepared me for the brutality of those first cobbles. You’re instantly being pounded by the ceaseless bumps and it feels like you’re riding up a thousand curbs in succession. The cobbles were wet and even in the first 200m I saw two crashes, five punctures and three lost bottles! The selection process had started! Some 2,000m later, I emerged back onto a road and it took ten seconds or so for my legs and arms to stop tingling and to start pedalling normally again. “Twenty-six more of these? No chance!” flashed through my mind. ” The best I could do would be to describe it like this — they plowed a dirt road, flew over it with a helicopter, and then just dropped a bunch of rocks out of the helicopter! That’s Paris–Roubaix. It’s that bad — it’s ridiculous.” Chris Horner, professional cyclist. 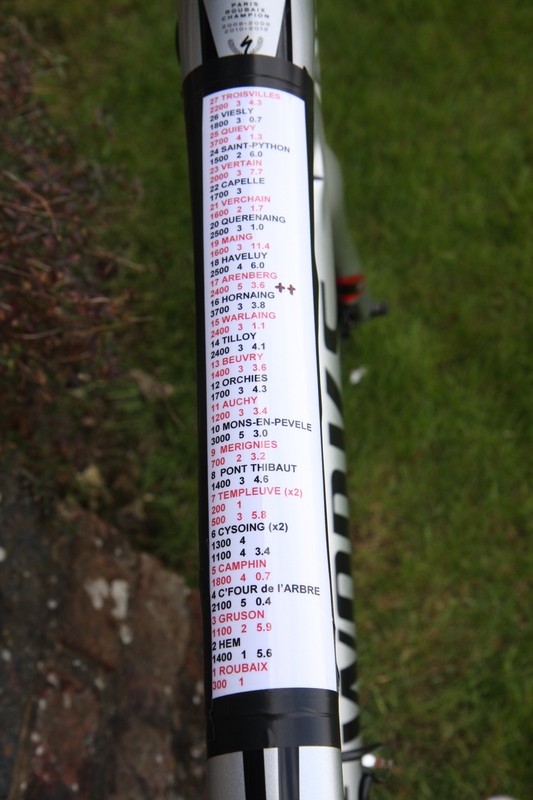 Taped to the top tube of my bike was my own personal guide to the secteurs, numbering and naming each one from 27 down to 1 and giving me the length, difficulty rating and distance to the start of the next one. Viesly was up next in four kilometers: just enough time for a drink and little else! The night before, John Deering, the esteemed cycling author and one of our hosts at La Fuga, had given us various pieces of advice. Two things in particular had really stuck in my mind, namely to accelerate onto each section of cobbles and try to hold that speed throughout, in an attempt to ‘float’ over the bumps. Secondly, John had also encouraged us to ride the cobbles themselves, rather than taking the ‘easier’ option offered by the smoother grass verges which sometimes appeared on either side. In fact, the secret was almost invariably to ride the ‘crown’ of the cobbles – the middle point of the gently convex pavé, where you would expect to get the smoothest ride and therefore the fastest passage. Each section passed in a blur, much faster than expected and the intervening road sections never seemed very long. Every one was different – some were rougher, others slightly smoother, some went up and some went down and some were dead straight, while others contained 90 degree corners, always covered in gravel and dirt. I realised that I’d settled into it and despite the ever present danger, was actually beginning to enjoy myself but then, just before the ride reached the first of three ‘five star crunch points’, the worst possible thing happened: it rained. Heavily. 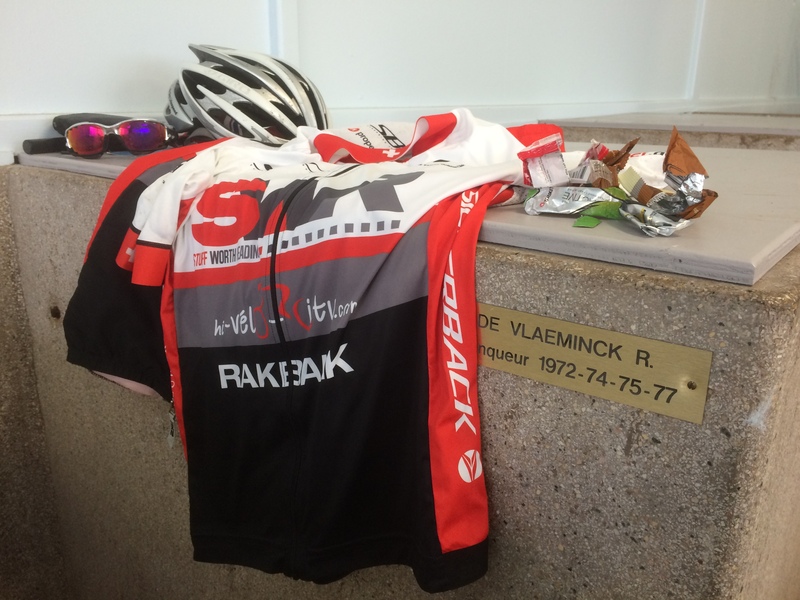 “A Paris–Roubaix without rain is not a true Paris–Roubaix. Throw in a little snow as well, it’s not serious.” Sean Kelly, the two-time Irish winner, in 1984 and 1986. So I found myself on the four-star Haveluy, secteur 19, with mud adding another layer of complexity to affairs. Then real disaster struck: for some inexplicable reason, a van was driving slowly up the pavé ahead of me, leaving me with no choice but to leave the crown and take to the verge to avoid it, but I had to put my right foot down to avoid crashing. Something had happened to my cleat though and I found myself unable to clip back in with my right foot. I rode another 500m or so and decided I was going to have to get off and take a proper look. So I found myself sitting in a field of Flanders mud, trying to pick dirt out of my Speedplay cleat with a stick and cursing the idiot in the van. “Hell, these innumerable straight, laborious, tortured and gutted roads and paths spiked with glistening and slashing cobblestones, where one is astonished to see bicycles hurtling along, and where one doubts that a single racer will get through unscathed.” Yves Berger, writing in 1982. I wasn’t sure whether I had fixed it, so I remounted and set off on the second section of Haveluy. Clipping back into my pedal seemed to take much more force than usual and my foot suddenly disengaged a couple of times. This was now properly dangerous – in the end my foot would probably fly off into my front wheel and I’d be somersaulting head-first down the pavé. I tried twisting my foot more than normal and the pedal seemed to engage. Success! But maybe not – I tried unclipping but couldn’t. So now I was riding a really difficult set of soaking wet cobbles and if I crashed, my foot wouldn’t release. It was the equivalent of heading down a black run, knowing that one of your skis was locked to your boot. I’d been concentrating hard since secteur 27, but now I knew the very definition of utter focus – a crash was out of the question – I’d probably break my right leg. Somehow I managed to exit Haveluy without mishap, but I knew that arguably the hardest secteur of all, the Trouée d’Arenberg, five-stars and just six kilometers away, was looming rapidly. I decided I would have to take the shoe off, but if I stopped, I’d be unable to unclip and would fall over. I consider finding a likely grass verge, but decided a fall of any type was risky, so in the end I spied a likely lamp post in a small village, jumped my bike up onto the curb, braked to a complete stop and leaned, stationary, against the post. I could now unzip my overshoe, undo my shoe and get off the bike in my socks. Anyone watching must have wondered what on earth was going on! I had to wrench the shoe off the bike, but still couldn’t really see what the problem was, so set off again. This time, my cleat seemed to engage with the pedal reasonably well, so I focused my mind back on the task of staying upright and tried to prepare for Arenberg. 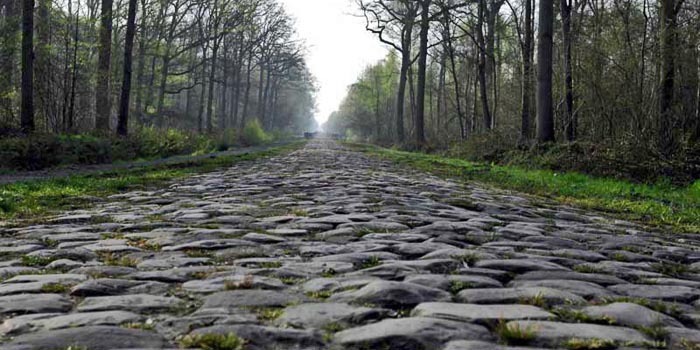 The Trouée d’Arenberg is the most legendary pavé in the world. The 2,400m of cobbles were laid in the time of Napoleon. They’re large, irregular and have ‘wheel swallowing’ gaps between them. They drop slightly at first and then gently rise again to the exit point. The ‘trench’ is dead straight and has a ‘vanishing point’ exit. The forest on either side contributes to the uniqueness and keeps the cobbles damp and mossy! In the professional race this is where the first crucial selection is made and it’s a true bunch sprint to get to the entrance in a reasonable position. A crash or a puncture at this point spells the end of your race, since there will be no coming back to the leaders. The favourites always stay near the front and by the time they exit Arenberg, a select group has usually emerged. 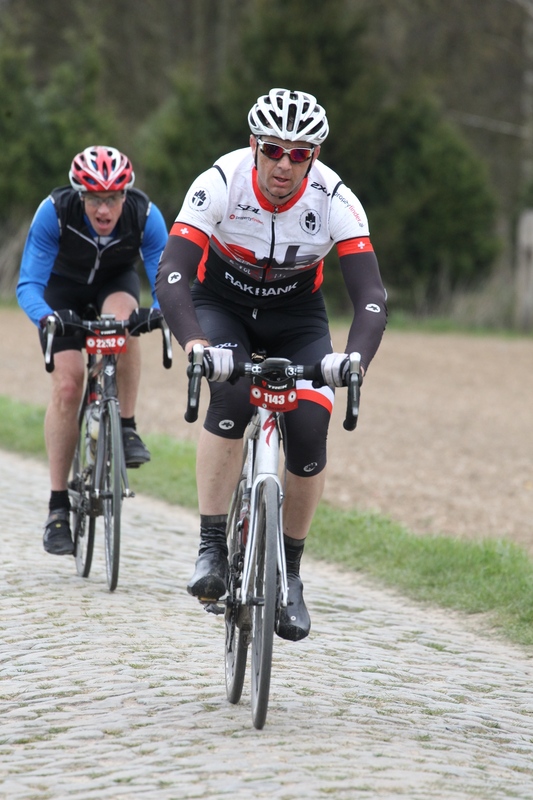 I stuck to my game plan, accelerated slightly as I saw the sign for Arenberg and hit the cobbles at around 40kmh. I was instantly bounced all over the place and had to really fight to keep my bike straight. “Savage” flashed through my mind, followed by “this is properly dangerous!” I could see mud oozing upwards from between the stones and heard a huge crash behind me, as a number of riders went down. Then, my right foot popped off the pedal again and I had to work really hard to stay upright and relocate the pedal without losing too much speed. A crash was unthinkable – these cobbles had massive edges and would do real damage, far worse than any normal road surface. The pounding seemed to go on forever. It was very marginal. 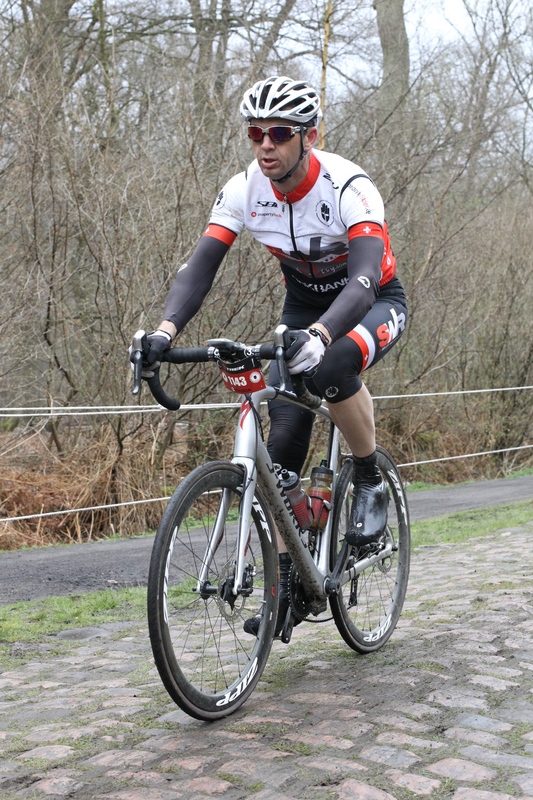 Somehow, I exited Arenberg with one leg doing most of the work and without falling. “From the bone-jarring chaos that has consumed the last five minutes of your life, all of a sudden you emerge on to an asphalt road, non-descript and probably a very poor surface; after the forest it feels like a carpet made of the softest velvet and the silence is deafening.” British rider Roger Hammond, writing for Rapha in 2011. I tried to think clearly as I started the three kilometer road section back south westwards into a strong headwind. Could I reach Roubaix with only one pedal working? I doubted it. Halted briefly by two separate train crossings, I still failed to come up with a solution and rode the Wallers secteur with the same recurring problem. The next secteur was Hornaing: three-stars and 3,700m long. My foot popped out of the pedal five times and I realised that my race was probably over. I dismounted again as I exited the pavé and removed my shoe, but still couldn’t see a clear problem. I set off again but then spotted a man standing next to what looked like a mechanics van and pulled in. “Do you have a screwdriver?” I asked him. He turned out to be Sam, running Le Domestique Tours and as I sat on the ground and worked away with his tools, he sprayed my other cleat with lube. I disassembled the entire cleat and rebuilt it. Somehow, one of the engagement springs had been driven into the pedal body, but I’d now put it back in place. Sam added some more lube and I set off, thanking him profusely and telling him that if I didn’t return, it had worked. And it had! I could clip in and out with ease and my spirits soared. I was back in business and seriously motivated. I checked my bottles, ate a Bounce Ball and a packet of Clif Shots and put my head down: 15 sections and c.75km to go. Perhaps I could reach Roubaix after all and I realised that I was smiling. The cobbles no longer felt dangerous – after Arenberg with one leg, nothing would feel so precarious, so I started to pick up the pace. Sector 10 was my next big test: Mons-en-Pévèle. Five stars and really hard, at 3,000m long and into a very stiff head wind. The upside of course was that the rain was long since past and the wind had rapidly dried the cobbles, which was just as well because some of them were extraordinarily polished and staying on the crown was a real challenge. Somehow, I was managing to keep upright and avoid any further mechanical issues, including punctures, but all around me was destruction: of tyres, wheels, bikes, bodies and minds. Exiting each section, you’d see a large group of riders who had either stopped, or who were crawling onwards at a really slow pace. It was similar to the way I’d expect to see people high on a Himalayan peak: physically exhausted and mentally impaired. I was lucky therefore – I was feeling good, I was increasingly confident on the cobbles and John’s advice kept me steadfastly riding the crown, even when all around me people were slinking off into the verges in the hope of finding a faster, or safer passage. Le Carrefour de l’Arbre, the final 2,100m five-star section, was just as difficult as expected and even the last couple of pieces of pavé, at Gruson and Hem, seemed hard, but finally all that remained was the velodrome. “I don’t care. I proved to myself that I was a man, because I suffered, but I still finished. I finished.” Christian Raymond, after finishing twenty minutes behind champion Rik Van Looy in 1961. All day I’d been riding a piece of history, but it never felt more so than when I entered the velodrome and turned the right hand corner onto the track. Ahead lay just one and a half laps of the most famous finishing oval in the world of cycling. I rode straight up to the highest point of the banking, determined to savour every moment and finally crossed the line in 6’32”. – Ian Stannard of Team Sky, speaking to the Guardian before this year’s race. Only then did I realise how deeply tired I was and almost immediately I could feel the first twinges of cramp in my thighs. It was starting to rain again and I headed to the La Fuga tent to collapse in a heap and hear how everyone else had got on – I hadn’t seen anyone I knew all day! Amidst reports of success, crashes, broken bones, destroyed bikes and trips to hospital, I remembered that there was one final thing to be done. Another prized oddity in professional cycling, the Roubaix velodrome showers are as traditional to the race as the cobbles themselves. Plaques with the names of previous victors adorn each shower, a monument to the toughest men in the sport. “You get into the velodrome and go into the showers, and De Vlaeminck, Merckx, Hinault—all these legends have been in there before you, and you’re scrubbing mud out of your ears. It’s all part of the adventure.” Stuart O’Grady, the first, and still only non-European winner of the race, speaking in 2007. Perhaps fittingly for such an epic day, I was in luck and found Roger de Vlaeminck’s shower empty. He won the race four times, pedalling his way into legend. I slowly stripped off my SWR kit, now covered in mud and dust and contemplated one of the most extraordinary days I’d ever spent on a bike. I stayed in the shower for 15 minutes, soaking up the warmth. Outside, it was still raining: a perfect day at Paris-Roubaix. “In the showers we often discussed our misery… It was an apocalyptic vision, seeing all those wounded men who sit down but can’t get up. That steam everywhere. It’s extraordinary.” Jean-Pierre Danguillaume, a seven time stage winner at the Tour de France. It’s said that most riders develop a love-hate relationship with the race. Many say they’ll never come back after riding it for the first time, but almost all do. Sir Guy Litespeed, Team SWR – April 2015.